* Image is not scaled to the actual sizes of our magnetic lifting devices. For every selection process of lifting magnets, you must know your loads’ weight, shape, material and contact area to determine the necessary amount and size of magnets. One important question to ask yourself: Are your loads thick? The loads need to be thick enough for the magnetic field of magnet to infiltrate through and yield adequate amount of lifting strength. The core technology of Armstrong NL-B permanent lifting magnets is using powerful neodymium magnets and rotate the center piece to “ON” and “OFF” positions to generate and terminate magnetic fields. For thinner plates, portion of the magnetic field passes deeply through the metal and the lifting magnets rated capacity would be decreased. When the plate is thin enough to the point that magnetic fields cannot be formed, it would be almost impossible and dangerous to turn the handle. The larger models of permanent magnetic lifters have larger magnetic fields and therefore pass through metals even deeper and wider and have greater load thickness requirement. If your metal plates are thin individually and stacked on top of each other, the penetrated magnetic fields would very likely attract more than one sheet at a time. When this happens, you should stop your operation as the bottom sheet(s) could possibility drop as the excess magnetic fields may not be strong enough to hold it with safety factor of 3:1. In general, the more poles of lifting magnets faces, the shallower the magnetic fields. 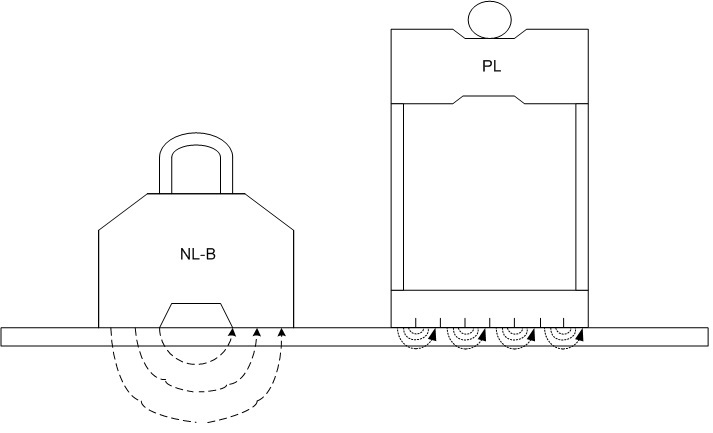 NL-B permanent lifting magnets have 2 poles, thus one large magnetic field that can penetrate deep into and possible through metals. For thin plates, you would want to select magnetic lifting devices with small spacings among the magnetic poles which generate many small shallow magnetic fields instead of one single large deep field. Our magnetic plate lifters are an excellent choice which have many pole-faces with small magnetics fields accumulated to have magnetic attraction strength strong enough to safely hoist loads up to 1100 lbs.